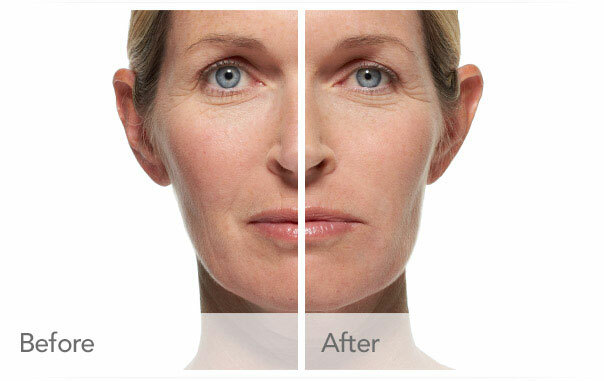 Radiesse® is a unique facial filler made of calcium hydroxyapatite. This is a naturally-occurring substance in the human body. Since Radiesse® is not derived from human or animal tissue, there is no risk for infectious transmission. This product has the unique characteristic of being able to stimulate natural collagen growth. Therefore the product provides the initial "filling" or "plumping" effect, along with an extended filling effect. Results are evident immediately and can last 12 months or longer. Radiesse® is most often used to fill the deep folds between the nose and the lips (nasolabial folds), the "marionette lines" of the mouth, any deep furrows or wrinkles of the face, and the grooves along the jawline adjacent to the jowls (prejowl sulcus). Radiesse® is also a powerful agent used for cheek enhancement. The aging process is often associated with loss of volume of the midface area. Radiesse® is a nice alternative to surgical correction of this area and can be easily and safely performed. Injections are performed in Dr. Sparano’s procedure room and typically take 30 minutes. Patients experience minimal or no discomfortduring injections. Side effects are usually minimal and may consist of temporary swelling or bruising. Radiesse® is a powerful sculpting agent. It is a good alternative to fat transfer techniques when only subtle sculpting is needed to enhance areas of the face demonstrating mild loss of volume.